Research in the early 2000s had indicated that a leading cause of the Cocoanut Grove Fire was the presence of methyl chloride within the air conditioning system, a highly flammable chemical. A brilliant flash-over was reported by witnesses in the ceiling of the lounge, likely due to flammable gases spontaneously combusting at their flashpoints. People were asphyxiated in their seats at the restaurant from a lack of oxygen or from toxic gases. I find no evidence of incendiarism. 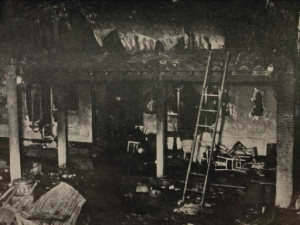 A bus boy, aged sixteen, employed by the Cocoanut Grove on the night of the fire, testified to lighting a match in the process of replacing an electric light bulb in the corner of the Melody Lounge, where the fire started, and dropping the match to the floor and stepping upon it. After a careful study of all the evidence, and an analysis of all the facts presented before me, I am unable to find the conduct of this boy was the cause of the fire. I have investigated and carefully considered, as possible causes of the fire, the following suggested possibilities: Alcoholic fumes, inflammable insecticides, motion picture film scraps, electrical wiring, gasoline or fuel oil fumes, refrigerant gases, flame-proofing chemicals. There is no evidence before me to support a finding that any of these or any combination of them caused this fire. This fire will be entered in the records of this department as being of unknown origin." The busboy was blamed by the public for starting the fire due to hearsay or reports in the press. The fire commissioner stated that many fixtures did not even ignite, and the height of the fire was only about two to four minutes in length. It would appear that gases combusted, and the fire quickly ran out oxygen (fuel) for the flames. Samples of the fixtures were not saved for future chemical analysis (deducing what did not cause the fire from samples likely could have eventually led to a conclusive determination).